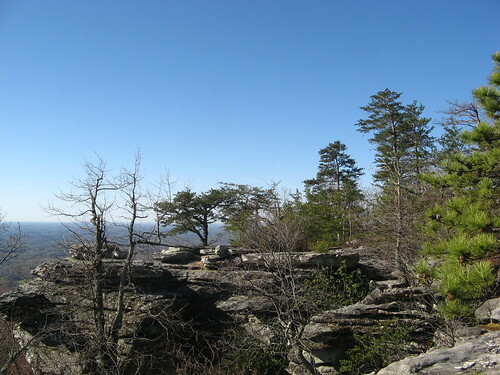 This’ll be a quick one — a jaunt up to Cook’s Wall at Hanging Rock State Park. While it’s under five miles, this is a pretty vigorous hike with lot of rocky trails and witness-the-earth’s-curvature views on a clear day. I did this hike on a cold, rainy day just after New Years and have wanted to check it out on a day with friendlier weather. Sunday was about as kindly as it gets around here. The next few weeks will represent the last chances to see the hills around here before the leaves return — buds were very noticeable on the trees if the morning light hit ’em just right. Finding Cook’s Wall is a cinch–just follow the signs. I started out from the trail by the park lake and took the first left turn just a short way up the trail. The climb is a good workout; the trail up to House Rock Rock ends at the trail to Cook’s Wall, where it’s a right turn and quite a bit more ascent. Plenty of chances to rest and soak in the view along one of the rock overhangs. You know how I am, with my weakness for trees growing out of solid rock. 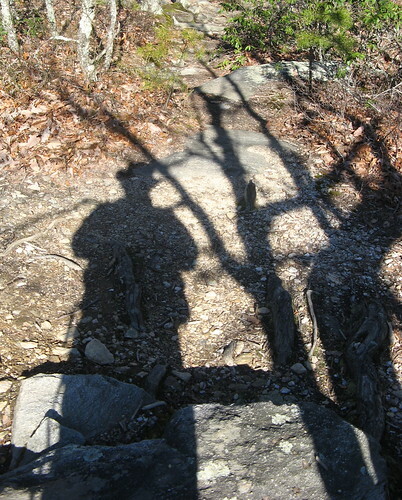 Morning sun creates great shadow shots. The trail to Cook’s Wall doesn’t see a lot of hikers, which makes it a nice get-away-from-it-all hike by Hanging Rock Standards. The park tends to get crowded on weekends, especially as the weather improves, but most people don’t venture out this far because it’s an out-and-back, rather than a loop. Views of the Sauratown Range make this hike worthwhile. 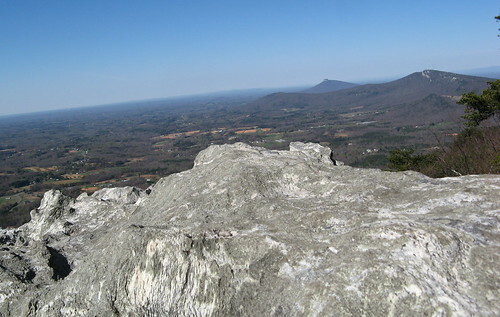 Bonus shot of Moore’s Knob, one of the most popular climbing locales at Hanging Rock. That’s gonna do it for this week; next week I’ve got something more ambitious in mind. Nice post Tom. 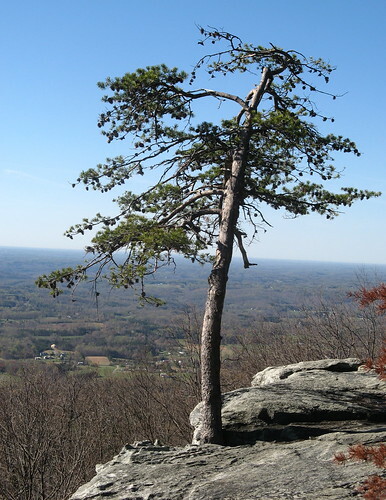 Look forward to seeing spring come to the Appalachians via your blog. 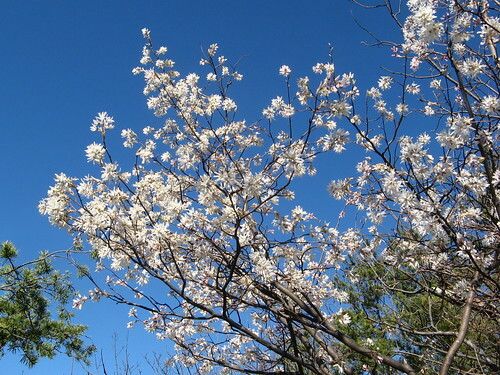 The blossoming tree is a serviceberry, probably downy serviceberry. Miguel: I’m hoping to make it up to the High Country, though perhaps not every weekend.